Organise and join cycling groups, find & create routes and track your bike ride! JOIN is the app for social cyclists. We make it quick and easy to find and meet new cycling friends, organize group rides, find local biking routes and create your own from scratch. Best of all, JOIN is completely free – give it a go, you’ll never have to ride alone again! Find a ride friend who shares your love of cycling in minutes. 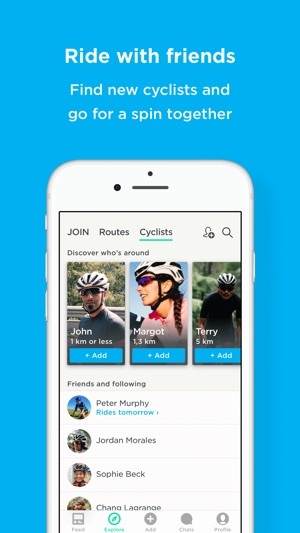 Browse cyclists in your area and become ride friends with a single tap. Whether you’re looking for one person or a large group to ride with, JOIN has it covered. Discover the best upcoming group rides near you – or anywhere in the world! View the route and take a look at important ride details on the interactive bike map. Found a ride you’d love to attend? Easily join in and meet your new cycling partners at the meeting point. Can’t find a cycling route or group ride that suits you? Don’t worry – you can create your own cycling route and organise your own ride. Create your route on the bike map, set the time to go for a ride then invite your cycling friends and other local riders. Everybody attending the group ride will automatically receive all the ride updates and any last-minute changes via push notifications. JOIN completely takes the stress out of organising a group ride, allowing you to focus less on organising and more on cycling! 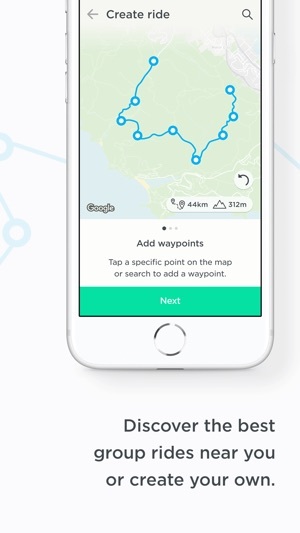 JOIN supports integration with Facebook, Garmin Connect and Strava, making it easy to track your bike rides and import your ride track to your JOIN rides and even upload your favourite photos from the route! Connecting your JOIN account makes it easy for you to see whom of your contacts and Facebook friends are already using JOIN. • Find local cyclists in your area to ride with. 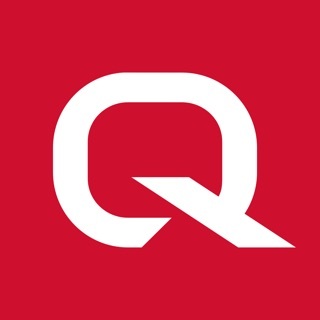 • Interactive bike map makes finding & creating rides effortless. • Discover the best local cycling routes and upcoming group rides. • Join group rides and meet cycling friends with a simple tap. • Create your own cycling route and organise group rides. • View detailed information about each ride. 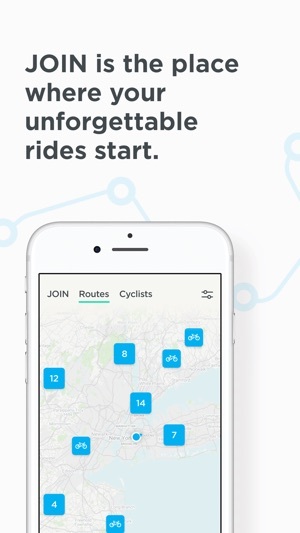 • Automatically update each rider with ride details & changes via push notifications. 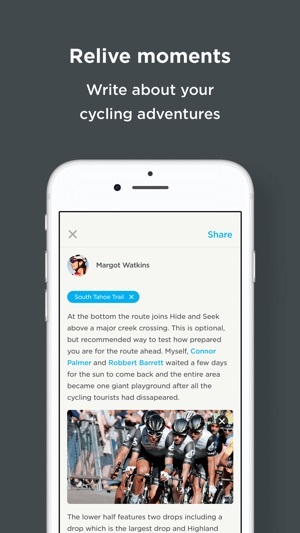 • Integrate with Garmin Connect, Strava and Facebook to track your ride, upload photos from your bike ride and see whom of your friends is already a JOIN user. Thank you for riding with JOIN! We fixed an issue which prevented you from logging in with Facebook. Sorry for the inconvenience! Have a new idea? Something that doesn’t work? Reach out to us on support@join.cc. 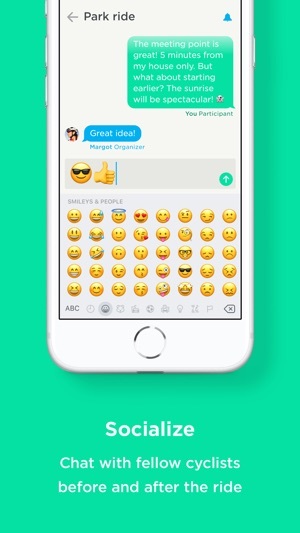 This app has a lot of potential but I really don’t like that you can’t have a ride that isn’t visible and open to everyone in the world. I thought this app seemed to have potential, but I live in the US and it is showing me rides in Africa. Deleted. (1) Cannot import a route (GPX file). It has to be plotted on the small phone screen. (3) Does not allow URL link from ride description to external details about the ride. When there is a URL in ride description, it is not hyperlink to open in web browser. (4) Need concept of clubs for organized group of riders. © Copyright 2017, JOIN Sports B.V.